Average weekly earnings of non-farm payroll employees were $1,012 in December, little changed from the previous month. Compared with 12 months earlier, earnings grew 1.8%. Non-farm payroll employees worked an average of 32.5 hours per week in December, down from 32.7 hours in November and 32.8 hours in December 2017. To explore the most recent results of the Survey of Employment, Payrolls and Hours, visit the "Earnings and payroll employment in brief: Interactive app." In the 12 months to December, average weekly earnings were up in 7 of the 10 largest industrial sectors, led by accommodation and food services. Earnings were little changed in construction, public administration as well as professional, scientific and technical services. Compared with December 2017, earnings in accommodation and food services increased 4.3% to $412, mostly due to the full-service restaurants and limited-service eating places industry. Earnings in this sector have been trending up since the spring of 2017. Year over year, Ontario and Quebec have been the main contributors to higher earnings in the sector. In the 12 months to December, earnings in health care and social assistance grew 4.2% to $938 with increases in most subsectors. Year over year, earnings in the sector rose in five provinces (Ontario, Nova Scotia, Quebec, Alberta and British Columbia) and were little changed in the remaining five. On a year-over-year basis, average weekly earnings in the retail trade sector rose 4.1% to $611, driven by motor vehicle and parts dealers, as well as health and personal care stores. Earnings in retail trade trended up from August 2017 to the spring of 2018, and have been relatively stable since. Compared with December 2017, earnings in administrative and support services increased 4.0% to $835. 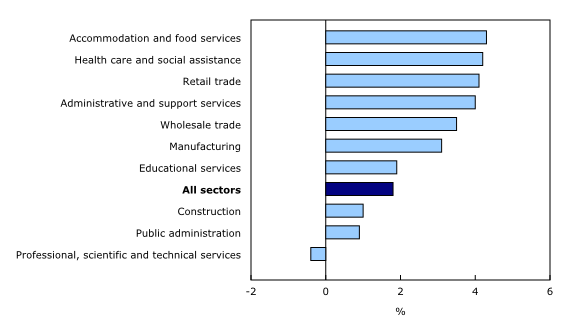 Employment services, as well as services to buildings and dwellings contributed the most to the earnings growth in the sector. Earnings rose most notably in Alberta (+5.9%) and Ontario (+5.6%). In wholesale trade, average weekly earnings increased 3.5% to $1,253. Earnings growth was observed in several industries, with food, beverage and tobacco wholesalers contributing the most to the rise. For payroll employees in manufacturing, earnings were up 3.1% to $1,139, largely due to the machinery manufacturing industry. 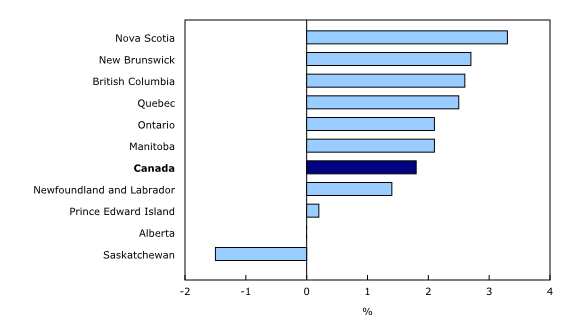 Earnings growth in the sector was driven by Quebec. In the 12 months to December, average weekly earnings in educational services were up 1.9% to $1,060, mostly due to elementary and secondary schools. Compared with December 2017, average weekly earnings rose in seven provinces, led by Nova Scotia. At the same time, earnings declined in Saskatchewan and were little changed in Prince Edward Island and Alberta. Average weekly earnings in Nova Scotia increased 3.3% to $890 in December, driven by health care and social assistance. Earnings in the province have been trending up since May 2018. In the 12 months to December, average weekly earnings in New Brunswick grew 2.7% to $922, with health care and social assistance as well as professional, scientific and technical services contributing to the rise. In British Columbia, earnings increased 2.6% to $982 in the 12 months to December. Many sectors contributed to the growth in the province, notably construction, health care and social assistance, and wholesale trade. Earnings in the province have been relatively stable in recent months, after a period of increases from May to August. 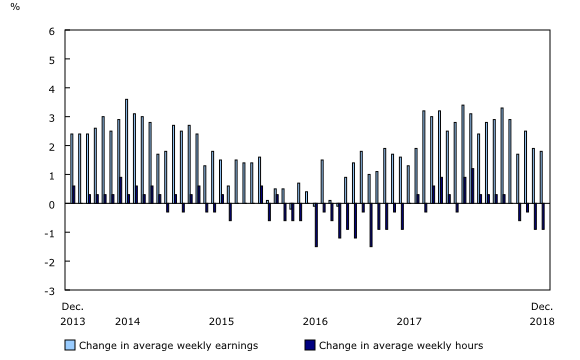 On a year-over-year basis, weekly earnings in Quebec rose 2.5% to $946. Manufacturing as well as health care and social assistance contributed the most to the rise. Earnings for payroll employees in Ontario rose 2.1% to $1,035 in December. Health care and social assistance as well as construction were the main contributors to the rise in the province, which was tempered by a decline in finance and insurance. For payroll employees in Manitoba, average weekly earnings were up 2.1% to $942, driven by manufacturing, transportation and warehousing, and wholesale trade. Employment grew in these three relatively high-paying sectors, contributing to higher average weekly earnings in the province. On a year-over-year basis, weekly earnings in Newfoundland and Labrador grew 1.4%, to $1,051. Increases in educational services, manufacturing and public administration were tempered by a decline in transportation and warehousing. Average weekly earnings in Saskatchewan decreased 1.5% to $1,018 in the 12 months to December, driven by declines in construction as well as mining, quarrying, and oil and gas extraction. In December 2017, earnings in Saskatchewan were at their highest point since comparable data became available in 2001. For payroll employees in Prince Edward Island, average weekly earnings were little changed at $851. A decline from December 2017 to July 2018 was offset by growth in the months since. In Alberta, average weekly earnings were little changed at $1,148. There were increases in many sectors including health care and social assistance, manufacturing and retail trade. This growth was offset by employment declines in the high-paying construction and mining, quarrying, and oil and gas extraction sectors as well as declines in average weekly earnings in construction. Alberta has had the highest average weekly earnings of all the provinces since May 2005 when it surpassed Ontario. The number of non-farm payroll employees decreased by 20,500 from November to December. The largest monthly declines were in construction, retail trade, educational services and public administration. At the same time, payroll employment increased in some sectors, led by health care and social assistance. On a year-over-year basis, the number of payroll employees rose by 321,600 (+2.0%). Employment grew in most sectors, led by health care and social assistance (+66,900 or +3.4%), professional, scientific and technical services (+45,400 or +5.0%) and manufacturing (+44,100 or +2.9%). In contrast, declines in payroll employment were observed in information and cultural industries (-6,700 or -1.9%). Compared with December 2017, the number of non-farm payroll employees increased in every province except Newfoundland and Labrador, where it decreased. On a year-over-year basis, average weekly hours worked decreased in five provinces (Saskatchewan, Ontario, British Columbia, Newfoundland and Labrador and Alberta) and was little changed in the remaining five. In the 12 months to December, the average number of hours worked declined in 6 of the 10 largest industrial sectors (accommodation and food services, manufacturing, retail trade, administrative and support services, construction as well as health care and social assistance). At the same time, the number of hours worked increased in educational services. The mining, quarrying, and oil and gas extraction sector encompasses three subsectors: oil and gas extraction; mining and quarrying; and support activities for these two subsectors. In December 2018, half (50.0%) of the 201,100 payroll employees of this sector were in Alberta, followed by Ontario (13.3%). As a proportion of all payroll employees, the mining, quarrying, and oil and gas extraction sector was most prevalent in Alberta (5.0% of all payroll employees in the province), followed by Saskatchewan (3.6%) and Newfoundland and Labrador (2.6%). Compared with 12 months earlier, the number of payroll employees was little changed in the sector in December—despite declines in Alberta (-3.0%) and Saskatchewan (-1.6%). 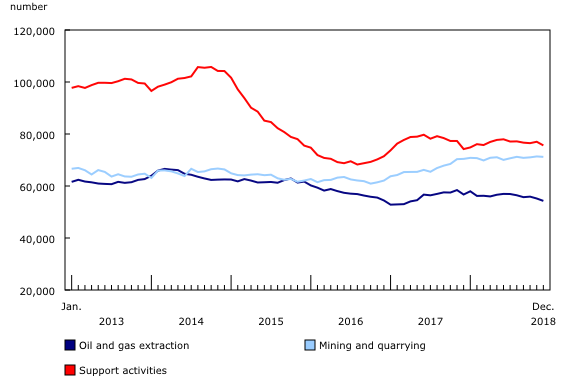 The decrease in employment in the oil and gas subsector (-4.3%) was offset by increases in the mining and quarrying subsector (+1.1%) as well as in support activities (+1.9%). The average number of hours worked per week decreased from 40.6 hours in December 2017 to 38.7 hours in December 2018. Average weekly earnings declined 3.6% over the same period. On January 1, 2016, the world officially began implementation of the 2030 Agenda for Sustainable Development—the United Nations' transformative plan of action that addresses urgent global challenges over the next 15 years. The plan is based on 17 specific sustainable development goals. With the March 27 release of January 2019 data, estimates from the Survey of Employment, Payrolls and Hours (SEPH) will be based on the North American Industry Classification System (NAICS) 2017 Version 3.0. Data will be revised historically back to 2001. At the same time, seasonally adjusted data will be revised based on the latest seasonal factors. Historical revisions will also be made to a small number of industries by province or territory. The SEPH is produced by a combination of a census of approximately one million payroll deductions provided by the Canada Revenue Agency, and the Business Payrolls Survey, which collects data from a sample of 15,000 establishments. Federal, provincial and territorial public administration data are collected from various administrative records provided by these levels of government. The key objective of the SEPH is to provide a monthly portrait of the level of earnings and the number of jobs and hours worked by detailed industry at the national, provincial and territorial levels. As a result of conceptual and methodological differences, estimates of changes from the SEPH and LFS do differ from time to time. However, the trends in the data are quite similar. To better understand the conceptual differences between employment measures from the LFS and SEPH, refer to section 8 of the Guide to the Survey of Employment, Payrolls and Hours (Catalogue number72-203-G). Unless otherwise specified, average weekly hours data are for hourly and salaried employees only and exclude businesses that could not be classified to a NAICS code. Improvements were made to the industry coding procedures starting in November 2018. This has resulted in a decrease in employment for the unclassified industries. The new coding procedures do not affect the total employment and earnings, but may affect estimates at the industry level. Real-time tables 14-10-0357-01, 14-10-0358-01, 14-10-0331-01 and 14-10-0332-01 will be updated on March 11. Data on payroll employment, earnings and hours for January will be released on March 27. Job Vacancy Statistics (5202) from the Survey of Employment, Payrolls and Hours for November are now available. The product "Earnings and payroll employment in brief: Interactive app" (Catalogue number14200001) is now available. This interactive visualization application provides a comprehensive picture of the Canadian labour market using the most recent data from the Survey of Employment, Payrolls and Hours. The estimates are seasonally adjusted and available by province and largest industrial sector. Historical estimates, going back 10 years, are also included. The interactive application allows users to quickly and easily explore and personalize the information presented. Combine multiple provinces and industrial sectors to create your own labour market domains of interest. To enquire about the concepts, methods or data quality of this release, contact Bertrand Ouellet-Léveillé (613-864-6641; bertrand.ouellet-leveille@canada.ca), Labour Statistics Division.